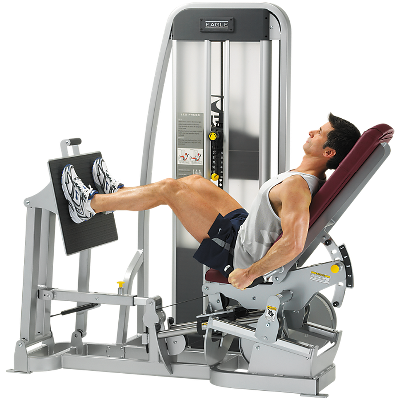 It serves as no surprise when you hear that leg press machines like the Cybex Eagle Leg Press are great at strengthening the major muscle groups of the legs such as quads and glutes (Gluteus Maximus). Yet what is surprising is just how many different leg exercises and muscles you can work simply by varying leg stance and back position during the exercise. Using various alterations of form and stance, the leg press can also work on calves and muscle groups responsible for quick, explosive movements from the leg. Feet lower on the footplate will engage the quadriceps more. Decline the back pad for greater activation of the quads. Straighten the back pad for an increase in actvation of the glutes. Next time you are considering how to spend your time in the gym when it comes to leg day, consider the Eagle Leg Press and you too can see results. You can see these techniques demonstrated at My Cybex Coach.